Student teams from around the tri-county area competed for the 2019 CEO Challenge Championship and the new “Ready for Market” Launchpad Awards on Saturday March 23rd at Baker College. The Western High School team, Starr, Inc. lead by teachers Derek Huntley and Steven Weller included students: Gez Starr, Drew Pastoriza, Cainen DeNoon and Zackary Nortley won the title as the 2019 CEO Challenge Champions with their innovative school attendance technology concept. These team members were awarded 7,500.00 in scholarships and 1,000 cash prizes for their creative idea. In addition, they were recognized as the team with the “Best Concept Execution” and won $500.00 sponsored by County National Bank and received another $500.00 as the “Most Innovative Team” sponsored by Michigan Works Southeast. “It thrills us to have such an entrepreneurial group of students as our 2019 champions” says President Connie J. Poisson. A school board presentation has been set for April 22nd to acknowledge their accomplishments to the Western School district. New for 2019 is the “Ready for Market” Launchpad Award for the team with the concept that the judges felt was the most ready to launch into the marketplace. 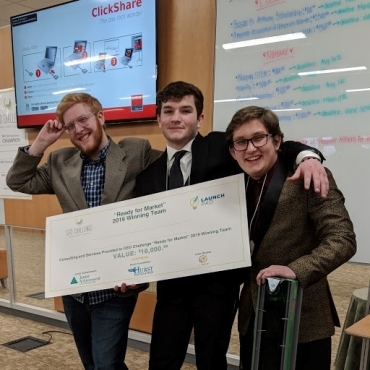 This recognition was given to Lumen Christi Team “Side Swipe” an innovative white board cleaning method created by the team: Patrick Lucas, Delton Langley and Jackson White and lead by teacher Sean Brogan and mentor Josh Glick. Junior Achievement of the Mi Edge is funding the opportunity for this team to be mentored by entrepreneurs at the Lean Rocket Lab over the summer months a value of $10,000.00. “Side Swipe has a chance to launch their idea and make it a reality says incoming JA Board Chair, Nick Arcaro. What an opportunity and learning experience for these young entrepreneurs”. Side Swipe was also recognized and awarded $500.00 as the Best Team Presentation funded by Old National Bank. Schools interested in getting their teams signed up for the 2020 CEO Challenge can contact Junior Achievement of the Michigan Edge, Inc. The kick-off event is scheduled for January 2020 and the Launch “shark tank” like event will be held March 2020. CEO CHALLENGE is supported by Junior Achievement of the Michigan Edge and the Hurst Foundation, Alro Steel, MIS Cares and the Phil and Pat Willis Foundation. For more information about how your student can participate, sponsorship opportunities, or to volunteer as a Business Mentor, contact Connie Poisson, JA President, cpoisson@jamichiganedge.com, at (517) 782-7822.